Receiving an average of seven and a half hours of sunshine every day in a climate similar to the Mediterranean, within driving distance of Sydney, and with easy access to beach and lake front locations, parks and bushland, the Hunter Valley offers everything you need to ensure your wedding day is romantic, affordable and fun. 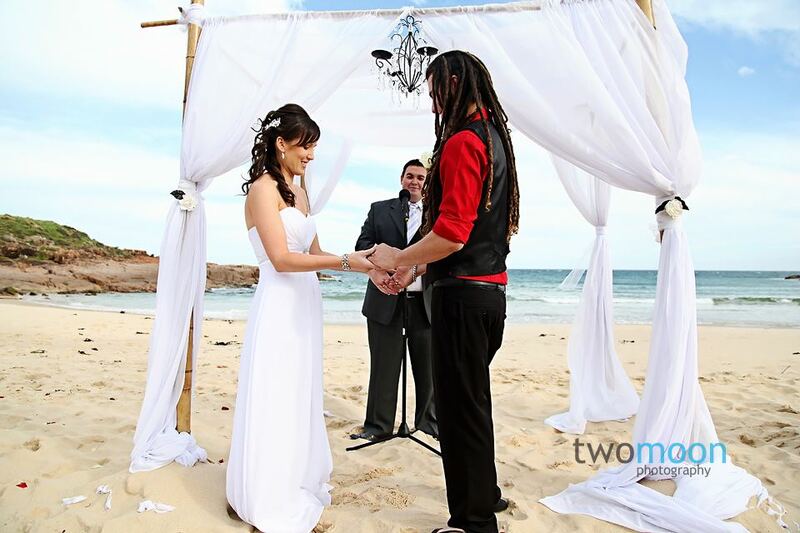 So if you’ve decided on this region as the place for your vows, the next step is to find a local marriage celebrant who knows the area, and is willing to work with you to ensure your wedding day is meaningful as well as memorable. The Hunter Celebrant Anthony Burke is the ideal choice. He is a young vibrant professional, who lives in the Hunter Valley and is authorised to provide marriage celebrant services in the Hunter Valley, Newcastle, Port Stephens, Central Coast and surrounding areas. Whether it’s indoors in a restaurant or function centre, or outdoors amongst nature, Anthony is happy to conduct your ceremony to your specifications. What does The Hunter Celebrant do? Apart from ensuring all the formalities have been taken care of and your marriage is registered according to Australian law, Anthony has put together an information pack full of helpful wedding-related suggestions and samples, including ceremony, vow and reading samples, poems, rituals and answers to frequently asked questions. The pack is designed to help you add personal elements to your ceremony, so it reflects your personality and wishes. For example, there may be certain cultural or family traditions that you would like incorporated into your wedding day. Talk to Anthony about your ideas and inspirations, and he will work with you to tailor a wedding ceremony that is relaxed, enjoyable and flows smoothly from the initial welcoming address to the final presentation of you and your groom as husband and wife. A Notice of Intended Marriage (NOIM) form needs to be signed by you and your groom between 18 months, and one month and one day before your wedding ceremony takes place. This is usually done on your initial visit to Anthony. You will also need to take your original birth certificate along at the first meeting to prove who you are, where you were born and your date of birth. If you have been married before, you will need to bring along a divorce or death certificate. Two people must officially witness your ceremony, and they must be over the age of 18, speak English and be sober. So don’t let your witnesses crack open the champagne until after the ceremony! Once your ceremony is completed, Anthony will send your marriage certificate and NOIM form to the registrar of births, deaths and marriages to have your marriage legally registered. You can request an official marriage certificate after five days. Your wedding day is one of the most important events in your life, and it should be a day of celebration and enjoyment. By hiring The Hunter Celebrant to conduct your ceremony, you will have a day that reflects your wishes and your values, held in one of the Hunter Valley’s many stunning and romantic locations. In 2008 only 35% of weddings in Australia were performed by ministers of religion. This means for those of you currently organising a wedding, there will be a lot who are looking for a celebrant. A celebrant plays an imperative part in your day. After all, they are the one who will be marrying you! You might figure it doesn’t really matter who does the ceremony as long as you end up married, but it is nice to have a bit of a connection with the person who is effectively doing the most important job on the day (aside from yourself and your partner of course!). A celebrant will set the mood for the service and can make a beautiful moment even more special. They can be happy, uplifting and warm. But remember that they are people with personalities so each celebrant will have his or her own personal style. Although they will most likely adapt to any style you want, if it is too much of a stretch from their regular service you might consider using someone who is more naturally suited to what you want. For example if you have certain traditions you would like to uphold make sure they understand what these are, as it will likely be obvious if they haven’t performed these traditions before. Arrange for a time to meet a few celebrants and have a chat with them, see if your personalities are suited and if they really understand what it is you are looking for. For example if you are someone who is looking for strong leadership or a person who can calm your nerves then you don’t want to choose a celebrant who is naturally quiet or nervous themselves. The same could also be said if you have a strong personality and very definite ideas on what you want on the day, you won’t want to have a celebrant who is also strong minded and already has their own idea of what you should do. When meeting with them also see what type of equipment they have so you don’t double up on hiring. For example, if it is an outdoor wedding where you may need a microphone and speakers check to see if the celebrant will be bringing this along or whether you should be organising this yourself. Also ask what their fees cover. For example, will the legal paperwork be included within the fees or come as a separate cost? Most celebrants should be happy to give you a full breakdown of their fees so you know what to expect upfront. Once you think you’ve found the right person ask to see their terms of agreement. Read through these carefully as these will list the celebrant’s terms and conditions and it is important you feel comfortable with these. Finally, if you are happy with all of the above, lock the celebrant in as soon as possible. They can be very busy and you don’t want to miss out on someone who is a perfect match!